Whole villages were rebuilt and local materials varying from the fine-grained limestone of the Cotswolds to the dusky brown sandstone of the north, and from the grid-patterned half timber of the West Midlands to. the close-set framing of East Anglian wattle and daub, were brilliantly exploited. 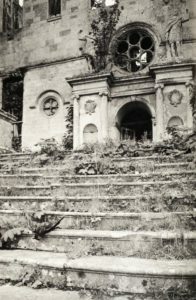 But it is the great houses of the period, their scale, their ostentation, their idiosyncratic and imaginative translations of the classical idiom and of classical symmetry, their fantastic, exuberant novelty which excite our attention today and seem to be of peculiar significance. It is impossible to imagine the effect of these buildings on those who watched them going up and who first saw the triumphant conclusions of their creators’ audacious fabrications. Four hun­dred years later they are still among the most exotic and most ingeniously planned works of architecture that have ever been seen. Even Longleat, at first sight one of the most restrained of these houses, is of startling originality. Of classical symmetry, it is set on the newly introduced high base and moves to the rhythm of the great storeyed, projecting, glass-filled bays which were one of the most spectacular inventions of the era. Great expanses of glass play as important a part in Elizabethan architectural design as they do in the buildings of today. The massive ornate bulk of Wollaton with its huge, tower-like central hall is so lightened by its enormous windows that it rises on its hilltop site above the surrounding industrialised landscape like an elaborate birdcage. Glass turns Montacute, Burghley, Earlborough, Fountains and Kirby into fabulous openwork structures. At Montacute the abstract patterns of gridded glass running across each of the three storeys emphasise the stately advancing and retreating movement of the design, contrast with the diverse forms of obelisks, semicircular pediments, curly gables and disc-shaped niches and set off the grave beauty and realism of the sculptured figures in military dress standing in recesses between the windows of the top floor. The profusion of tall windows in William Cecil’s palatial mansion at Stamford and the assertive vertical accent of the mullions counteract the powerful horizontality of the thick mouldings which divide the three storeys and hold down the riot of pepperpot domes and chimneys in the guise of Tuscan columns soaring above the parapet of arches and obelisks. At Barlborough the projecting hexagonal bays are fashioned almost entirely of glass. They shoot up above the roof line like turrets and enhance the grace and lightness of the whole captlvating composition. The grand display of windows filling the entrance range of quadrangular Kirby is clearly based on the design of a Perpendicular church nave but this is an utterly novel interpretation of the mediaeval invention, for pilasters have taken the place of buttresses and the facade is electrified by a porch of rivetingly bizarre aspect. Fashionably placed in the centre of the symmetrical front it is like one of those showy frontispieces of the period turned into stone. Rising high above the rest of the building it is surmounted by an attic storey which like that of a Continental Baroque conceit is purely decorative for there is nothing behind it. It takes the unexpected form of a Dutch gable flanked by flaming ball ornaments set at either end of a screen of seven Corinthian colonnettes placed on brackets bulging from a frieze of strapwork. 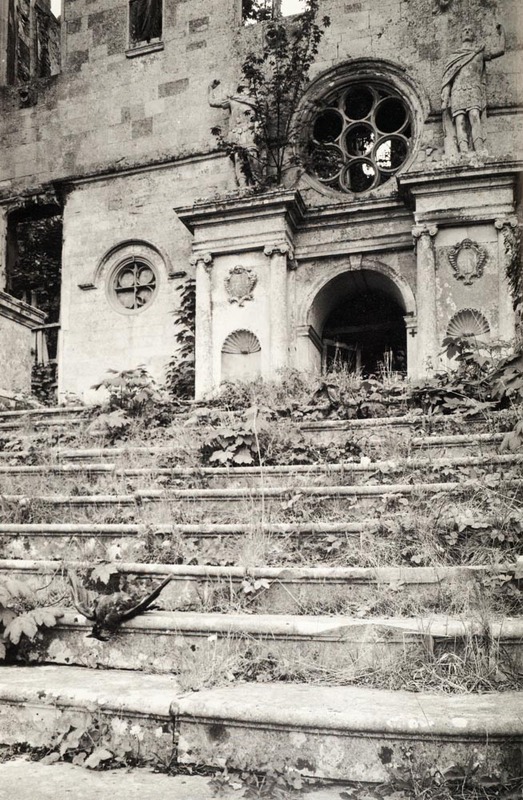 Below this an arched and balconied opening with a broken pediment rests on coarse brackets between pairs of tapering columns with bases like colossal leaves. The arched entrance is again flanked by coupled columns, fluted and with a stronger entasis than those above them though this is gently checked by a third column set round the corner on each side of the porch. 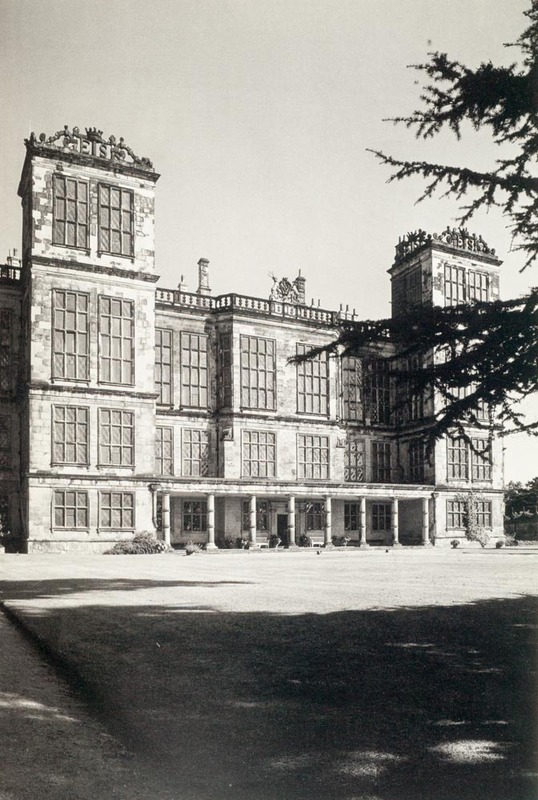 Glass makes a major contribution to the newness of all the houses so far contemplated; but it is at Hardwick that it makes its most overwhelming impact. This wonderful house is, as the old jingle goes, ‘more glass than wall’. It faces west and to come upon it from this direction at close of day is a most thrilling experience. The entire incredible stretch of leaded lights spreading across the front above a classical colonnade and embracing two rectangular towers is ablaze with the crimson and molten gold of the setting sun. Four more towers, two on the east side and one jutting from the middle of each end of the building, join with those of the west front to coax the whole prodigious conformation into slow angular and aspiring motion. From their tops all six towers brandish the letters ‘E. S.’, the initials of Elizabeth Shrewsbury (Bess of Hardwick) the formidable, zestful, gifted owner and the driving force behind Robert Smythson’s masterpiece. The battlements of sixteenth-century towers take many odd forms but none so individual and ostentatious as these. 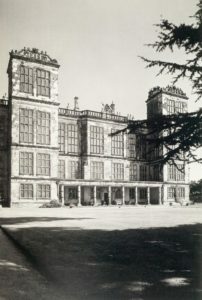 Bess of Hardwick’s personality is felt in every corner of the interior of her house – in the unusual choice, prompted by her passion for light, of the top floor for the most important rooms and in the novelty and fantasy of the architectural detail, the furnishings and decoration. A spectacular broad and shallow stone stair, departing utterly from Gothic practice, climbs. without a balustrade through half the length of the great mansion, giving unity to the composition and yielding sudden, unexpected vistas as It leads to rooms of delightful variety, rooms where tapestries, marble and alabaster sculptured ornament, velvet hangings, remarkable needlework, including collage made by Bess herself from monastic copes, and springy floors all stir up rumours of the life that filled them four hundred years ago. The most original and evocative of all are the High Great Presence Chamber and the Long Gallery. The source of the haunting beauty and romantic atmosphere of the High Great Presence Chamber is the astonishing, enchanting, moulded and painted plaster frieze . It is twelve feet deep and vividly contrasts with the dim tapestries below it, from which it is separated by a bold cornice. The tapestries interpret the story of Ulysses with ltalianate academic correctness; the plaster relief illustrates themes from classical mythology with marvellous freshness and spontaneity. Venus and Cupid, Diana and her attendant maidens, Orpheus and Ceres, huntsmen, dogs and wild animals all emerge from the spring and summer green of an English forest of smooth-stemmed trees and giant foliage. The frieze is a stupendous example of a new art. We stagges exalt to the Divine. The towers of Hardwick, the central mass of Wollaton, the upward shooting turret bays of Barlborough, all conjure up memories of the mediaeval castle and in an age when the ideal of chivalry was kept alive by the spectacle of the tournament, it was natural that architects should be stimulated by the castle architecture of the past. They refurbished some Gothic strongholds as grand houses, Wardour, Carew and Naworth among them, and they built castles of their own ardent imagining. East Lulworth, ruined and set by the sea, belongs to the same spellbound world as A Midsummer Night’s Dream. Rectangular and battlemented, with big circular angle towers, it rests on a high base and is approached by a rush of steps. The entrance, round-arched between Ionic columns, is surmounted by a mysterious wheel window filled with seven tangent circles which seem strangely significant. On either side of this window life-size figures, bare-headed and in the dress of Roman soldiers, raise their arms in salutation of whomever climbs the weed-encumbered steps.